2019 Road to Star Wars Celebration Chicago REY, FINN, ROSE TICO, and KYLO REN PINS from Sequel Trilogy! These pins from the conventions Pin Trading exclusives features art by Chrissie Zullo. The Rose pin is in new, sealed condition. Shipping is $8. Items will be shipped safely to insure that the condition is maintained. Shipping price is non-negotiable. If you have any questions or if you would like more photos PLEASE ASK BEFORE YOU BID! Please check out my other rare Celebration items up for auction as I will be updating them here and there throughout this week. 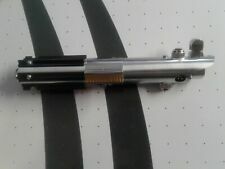 Star Wars Bladebuilders (Rey) Electronic Lightsaber 22” New See pictures for Details and of the actual item Free shipping is for the U.S.48 States only! Sabercore soundboard Feature. In hilt charging with kill key. Tap the button to cycle between "Sabercore Viridian" and "Sabercore Crimson". Hold button to select. While the saber is in idle/sleep, hold down button (you'll still hear the short beep (as explained above), but don't let go of the button. ). New in box! Pacakaging is in excellent condition, look at pics for details. Buyer pays for shipping, good luck! 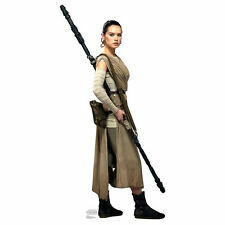 2019 Star Wars Celebration Chicago Pin Rey Pre-Order & Staff Exclusive. Condition is New. Shipped with USPS First Class Package. SWCC 2019 Chicago My First Star Wars Celebration Rey Exclusive Rare Button . Condition is New. Shipped with USPS First Class Package. Enter the world of Star Wars and launch into action and adventure! Subject to availability. Star Wars products are produced by Hasbro. Download the Hasbro Star Wars Studio FX app to make videos with toys. This Empire Magazine features Luke Skywalker and Rey from Star Wars: The Last Jedi. It is holographic and was released in 2017. Beautiful addition to any Star Wars collection. Condition is new. Comes from a smoke-free home. What you see in the photos is what you get. Please take a close look to ensure you’re happy with the item before purchasing. ROAD TO STAR WARS CELEBRATION 2019 CHICAGO EXCLUSIVE REY CHARACTER PIN TRADING. Condition is New. Shipped with USPS First Class Package. Rey Exclusive trading Pin Star Wars Celebration Chicago 2019 Disney official. Condition is New. Shipped with USPS First Class Package. Star Wars - The Last Jedi. 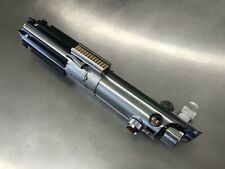 Graflex 3 Cell Replica Rey Luke Saber Prop Replica Kit - BATTLE WORN BLEMISH. Empty saber kit, plenty of room for electronics (electronics not included). BATTLE WORN / BLEMISHED VERSION: Kit will contain one or more blemishes such as differences and variations in plating, surface finish or other blemishes (the pictures show various examples of a blemished product). I bought it but never opened it. Star Wars Celebration 2019 Exclusive Pin. This was only available at the Star Wars Celebration shop. Condition is New. Shipped with USPS First Class Package. Never used and from smoke free environment. I have other pins up for auction right now, please bid. I do combine shipping. I have attached a Picture of the full set so you can see the other pins in the set. Feel like a Jedi and learn how electronics make a lightsaber work as you construct your own mini version of the lightsaber used by Rey in. Build your own light-up, mini Lightsaber. 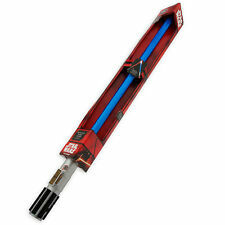 Authentic lightsaber design lights-up blue. 2019 Star Wars Celebration Chicago Rey Collector Trading Pin New On Sealed Card. Condition is New. Shipped with USPS First Class Package. Up for your consideration is a new SWCC 2019 Chicago My First Star Wars Celebration Rey Exclusive Rare Button. This button was given to attendees who's first time it was attending Star Wards Celebration 2019 in Chicago. The button features Rey holding her lightsaber to represent the Light side. If you love Star Wars and collect Star Wars pins, this one for you! Please note that I only ship within the US and expect payment within 24-48 hours. Bid with confidence and good luck! Also make sure to check out the rest of my listings. Thank you for checking it out! This super vibrant and detailed lanyard features a breakaway buckle on the strap for a quick release of your badge, ID, key or whatever you want to attach to the clip. Lanyard is perfect for security badges, ID's, keys, etc. Star Wars Rey Bag. Condition is Used. Shipped with FedEx SmartPost. Limited to 2500 only! Great gift for any Star Wars fans! THE LAST JEDI ~ HEROES REY WITH SABER ~ 22x34 Star Wars Poster ~ NEW/ROLLED! HEROES AND REY WITH SABER. THE LAST JEDI. Thousands to choose from. In nearly crush proof tubes for maximum protection! 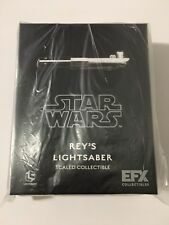 For sale is one Reys Lightsaber Scaled Replica Star Wars Last Jedi EFX Collectible Lootcrate. I removed the plastic so you know you are getting a quality box but the box has not been opened so that is your job! Disney Star Wars Celebration Chicago 2019 Pin - Rey - In Hand!!! It is very similar to Luke's from Episode IV. However, I can declare any value you wish. Auction is for the pictured pin of Rey that was an online exclusive for Star Wars Celebration 2019. Brand new in original packaging. For sale is a Star Wars galactic village lighted piece from the Hawthorne village collection. This is the twentieth issue in the collection and is titled Rey's Speeder. This piece has never been displayed. StarWars Celebration 2019 Exclusive " My First" Rey Button. RARE. Condition is New. Shipped with USPS First Class Package. Force FX Blue Lightsaber Star Wars Rey's The Last Jedi Black Series ...Like New. Condition is Used but has only been in display in a cabinet. Shipped with USPS Priority Mail. Its not going to help for any issues. The item is new in box. Pictures show the actual item and what's included. For auction today is a 2019 Star Wars Celebration in Chicago promo button. Measures 2.25” diameter in new condition. I will ship within 1 business day of receiving payment. Please see my other items as I love to combine shipping. From my smoke free home. Brand new, in hand Rey 2019 Star Wars Celebration Chicago Pin Trading Pin. Package has never been opened and pin and backer card are in great condition. We ship fast within 1 day of payment, usually same day.